Easier to travel to than you can imagine, Tahiti’s Faa’a International Airport is only an eight-hour flight from Los Angeles with daily nonstop flights. Located as far south of the equator as Hawaii is north, Tahiti is halfway between Los Angeles and Sydney, Australia, in the same time zone as Hawaii (only a two-hour difference from November to March, and a three-hour difference from April to October), and is on the same side of the International Date Line as North America. Reserving seats with Air Tahiti Nui’s newest promotional airfare start at just $898.00 per person (including all taxes) from Los Angeles to Papeete. This is the first step to take in making your Tahitian Wedding or Honeymoon a dream come true! Officially known as French Polynesia, the 118 islands and atolls are scattered across five far-flung archipelagoes and cover over 1.5 million square miles of the South Pacific. The ocean area is about the size of Western Europe, while the land area is only slightly larger than the state of Rhode Island. The most visited of the archipelagoes is the Society Islands — home to Bora Bora, Moorea, Taha’a and the largest island in French Polynesia, Tahiti. The Society Islands are a group of high, tropical lush islands encircled by coral reefs — offering beautiful azure blue and turquoise lagoons, the world’s most ideal location for Tahiti’s signature overwater bungalow. Once you arrive in French Polynesia, all guests are greeted with Tahiti’s traditional Tiare flower. This fragrant gardenia is seen regularly throughout the islands. Tradition holds that, if taken, women and men wear a flower behind their left ear (same side as one’s heart), if they are single, they wear it behind the right ear. Guests are then taken to their resort or escorted to the inter-island carrier, Air Tahiti, for direct connections to the outer islands. Air Tahiti services over 40 landing strips throughout the five archipelagoes of French Polynesia with 11 turboprop aircraft. The island of Moorea is less than 10 minutes from Tahiti, while the most visited island of Bora Bora is a 45-minute flight. Destination Weddings in the islands of Tahiti are now legally binding for American, Canadian, as well as many other nationals. Many of the hotel, resort and cruise line partners are eager to cater to this new opportunity. Couples who wish to be legally married in the islands of Tahiti can now have a memorable and meaningful wedding in one of the most beautiful, romantic places on Earth! We have outlined the necessary steps and documents required in order to have a legal ceremony in French Polynesia. Please note that this process will take approximately three to five months to complete. While it can appear to be a daunting task, we will help you every step of the way. Be sure and plan ahead as there are no shortcuts! A “Certificate of Non-Marital Status” (“Certificat de Celibat”) signed by a lawyer, translated into French and legalized by the French Consulate. Lawyers can be found on the consulate’s website. Expedite all materials to the mayor’s office of the commune in which the couple is getting married at least 45 days prior to the ceremony. The mayor’s office will then contact the bride and groom to advise them of the approved date and time of the wedding. On the day of the ceremony the couple, their guests and the witnesses go to the city hall (Mairie). The mayor (or an appointed representative from the mayor’s office) will perform the ceremony, in the presence of at least two witnesses in the language chosen by the wedding couple. After the ceremony, the mayor will give the couple a Marriage Certificate. This certificate will be dated and signed by the mayor’s office of the commune in which the marriage takes place. The planning process for a traditional Tahitian wedding ceremony generally begins at least 45 days prior to the ceremony. The marriage is civil and is sealed at a city hall with the mayor and an interpreter, if needed. Wedding ceremonies can take place either on a beach or at a resort (some resorts have overwater chapels) after the official ceremony at the city hall. Weddings are typically followed by a traditional Tahitian feast. Although there are variations depending on location, the following is a general description of traditional Tahitian wedding ceremonies throughout the islands of Tahiti. Customized ceremonies are also available upon request. While the guests are in their bungalow, the priest’s assistants will come to dress up the bride and groom with white pareo (painted wraps, like sarongs). The couple is adorned with specially created flower crowns and leis. The ceremony includes traditional gowns, a priest, a group of dancers and musicians, tropical flower arrangements, leis and crowns and a wedding certificate made of traditional “tapa”. The couple is then wrapped in a “Tifaifai” (Tahitian quilt) following the ceremony. After the ceremony, a cocktail is served to the couple. A romantic dinner can be prepared on a secluded, private islet, on the beach, or at a restaurant especially for the wedding couple. A professional photographer takes pictures of the ceremony. A memorable “tapa” with the couples’ joint Tahitian name will be given to commemorate this unforgettable occasion. Located on a private island, only accessible by boat, Le Méridien Bora Bora offers a variety of wedding ceremonies (after the ceremony at the Bora Bora City Hall) for couples anxious to get married in Bora Bora, the “pearl” of the Pacific. Guests will enjoy these magical moments from an overwater wedding chapel, the only one of its kind in the Pacific. The Heremoana Package includes the ceremony in our overwater chapel, traditional dances and songs throughout the ceremony, a romantic dinner at the restaurant or in the bungalow terrace. Honu Moon Ceremony includes the wedding ceremony in our overwater chapel, renewal and vows certificate, a glass of champagne on the chapel terrace and a romantic dinner on the chapel terrace. There is also a wide selection of activities available at the resort. The following are provided free of charge: two infinity swimming pools, snorkeling equipment (fins, masks), kayak/outrigger canoes, pedal boats, ping pong, billiards, beach volleyball, and stand-up paddleboards. 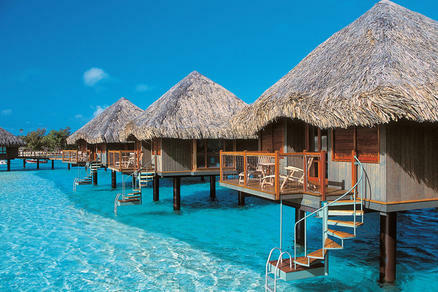 Le Méridien Bora Bora offers six distinct categories of bungalows, all of them entirely renovated in 2010/2011. Discerning guests revel in the authentic Polynesian feel while appreciating modern touches such as a direct-dial phone, safe, Flat Screen Television, minibar, and coffee and tea amenities. Our spacious, air-conditioned bungalows are approximately 60 square meters. While it is not possible to add an extra bed, all include a sofa bed to accommodate a third person. The bathrooms feature a full array of amenities plus a separate bathtub and walk-in shower. Lagoon Bungalows are situated at the very beginning of the pontoon, with convenient access to the beach or different outlets. They do not feature direct water access but have amazing views over the resort and Mount Otemanu. The six Beach Bungalows are perfectly integrated around the inner lagoon and provide an exceptionally warm welcome. Each also offers its own private beach, with deck-chairs and hammocks available. These bungalows are available with either a queen-size bed or two single beds. The Over-water Bungalows set on two large pontoons, have a large section of glass flooring providing fascinating undersea views. Each bungalow features a large private deck, which is an ideal place to read or take in the sunset. Ladders from the deck make it easy to slip into the lagoon’s warm water. The Premium Over-water Bungalows are ideal for travelers seeking romance and privacy. With Mount Otemanu vistas, these signature bungalows boast the best views in the resort and feature larger decks than Over-water Bungalows. The One-Bedroom Pool Beach Villas are extended Beach Bungalows, offering a separate bedroom, a large living room, an amazing terrace, and a private infinity pool. These Villas are located along the interior lagoon and can accommodate up to five guests (two adults + three children). For child safety purposes, the pool can be covered. An example of pricing for a 7 night stay this coming June at the Le Meridien is $9264 and includes round trip air from Los Angeles to Bora Bora, 7 night’s accommodations In a Overwater Lagoon View Villa, breakfast daily for two, and all associated taxes. A meal plan can be added for lunch and/or dinner. Wedding packages vary depending upon your needs. Rates are subject to availability at the time of booking and may change for your dates of travel. Travel insurance is highly recommended. **Tickets must be purchased by 04/30/2013; travel dates: Between 05/05/2013 and 06/24/2013; All fares include taxes, fees and fuel surcharges; This fare is not retroactive.